Eoghan Mac Giolla Coda is a fourth generation Irish beekeeper. Having learned the craft through helping his father, at a young age in Co. Tipperary, he became aware of the urgent necessity for conserving and protecting the various strains of Dark European Bees that still existed throughout Ireland. 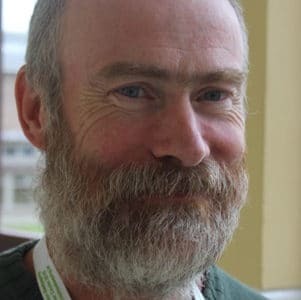 Eoghan has been enthusiastic in reviving and developing the Co. Louth Beekeepers Association, organising classes for beginners and lecture programmes for all members. He has established a breeding group which produces a number of queens each year from selected native stock as well as providing nuclei of docile bees for beginners each year. He continues to teach the long established GBBG techniques for the evaluation, selection and breeding of the native bees to his fellow Association members.